It’s important (no matter how experienced you may be) when it comes to performing SharpLight treatments, that you never become complacent in your clinical practice, protocols and procedures. Though we may consider ourselves to be experts when operating these devices, there is always room for error. It is important that we do not rush, that we pay attention and that we investigate and listen. One of the major steps we must always strive to complete properly, is to correctly assess our patient/clients’ skin type. 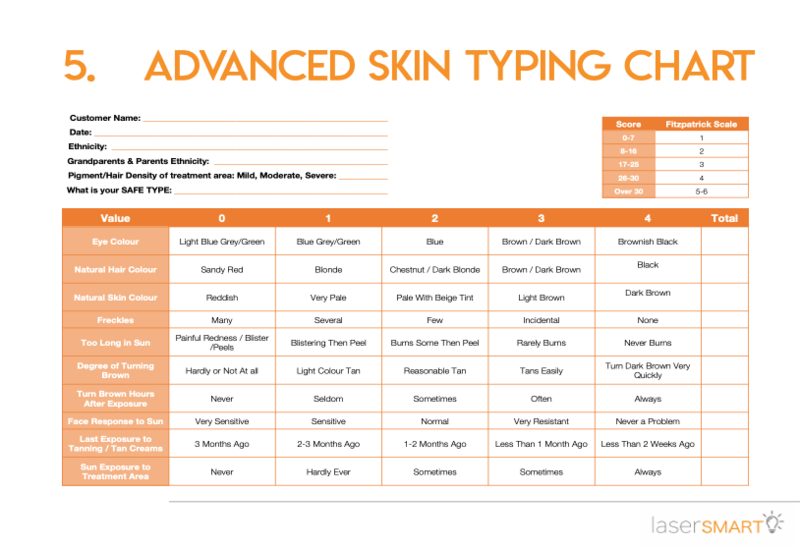 Skin typing plays is a huge role when performing any SharpLight treatment. The skin type of the patient/client can help to determine the: candidacy for treatment, treatment safety and treatment efficacy. Assessing a prospective client’s skin type must be done prior to their first treatment, and it is usually done during the initial consultation before the test patch takes place. Remember, when determining an individual’s skin type, you must NEVER assume what it might be. Patients/clients may manipulate the way they look through aesthetic or cosmetic procedures, ie: they may color their hair, wear color eye contacts, or go artificial tanning, etc. Natural characteristics: eye color, hair color, skin color, etc. In conjunction with a conversation, SharpLight recommends that you use our LaserSmart Safe Typing Chart to assist you with greater accuracy. Remember, if you are ever on “the fence,” or unsure of an individual’s skin type, for example: you might ask yourself “are they a dark lll or light IV?” It is always safer to refer to the darker skin type. We hope that you found some helpful reminders and tips of how to accurately determine skin types in this brief article. Our goal to provide you with the necessary tools to strive for continued excellence and success in your practice. For further information on skin typing, please refer to your SharpLight Clinical Training binder and SharpLight User Manual.